Our Miss Brooks was a situation comedy aired on CBS from 1948 to 1957. During its near-decade run, Our Miss Brooks was a highly popular radio series right from the start. It was then turned into a TV show and became one of the television's earliest hits. Eve Arden vividly portrayed Connie Brooks, an English Teacher at Madison High and single. Gale Gordon played the grouchy Madison principal Osgood Conklin. Jeff Chandler was Philip Boynton, the shy biology teacher and a romantic interest of Connie's. Richard Crenna played as Walter Denton, a student while Jane Morgan as addled Mrs. Margaret Davis, Miss Brooks' scatter-brained landlady. Gloria McMillan was the principal's daughter Harriet Conklin, Walter's girlfriend. The show was produced with a large and outstanding supporting cast and all characters were well-developed. In 1949, Eve Arden won an award for the top ranking comedienne for her role of Miss Brooks. 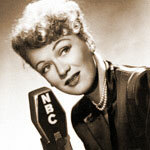 Eve Arden won an award for the top ranking comedienne in 1949. Upon receiving the honor, Arden joked, "I'm certainly going to try in the coming months to merit the honor you've bestowed upon me, because I understand that if I win this two years in a row, I get to keep Mr. Boynton." Indeed, the bashful biology teacher Mr. Boynton was thick-headed; interested only in his lab work and his pet frog, McDougall. Even though Miss Brooks' affection for Mr. Boynton was widely known on campus, the romance between Connie and him never materialized. To many radio fans, the show was highly regarded for its excellent production and cast. Miss Brooks was beloved and appreciated for her intelligence and her sharp, witty rejoinders.